Print and color this Father of the Year award and present it to dad on Father's Day. This fun craft is easy to make and dad will love it! 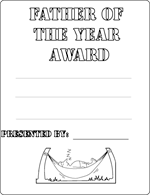 Print the award. There are two to choose from. 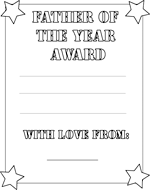 Click on the award you would like to print. Personalize the award and colour it. Carefully cut out the award and glue it onto a piece of construction paper that is larger than the award. This is will make a nice frame for the award. If you like, once the award is glued in place, decorate the frame with crayons or pencil crayons.